2016 has ended. Not too soon some people might say. At one point, it wasn't looking too good for any sort of telescope time over the festive period. Finally though, the weather cleared and presented me with a great opportunity to get outside on the first day of 2017. With no need to worry about getting up for work on Monday thanks to the New Year holiday, the timings fell perfectly for me to get out under the star, not worry about how long I was going to spend outside and put some quality time into getting some more photography practice in. Everything was charged, the stars were out and the neighbours were heading for their beds. As the lights went out from around the different properties, I set up the AVX and carried out my alignment tasks, With it only being a couple of days after New Moon and only hours after the rain had cleared, the skies weren't going to get much better. I needed to check how well the mount was tracking so I took a couple of frames. A little bit of evidence of star trailing, but I could cope with that and so I decided to crack on. And this is where I think I started to make a couple of errors. So good were the conditions that during the session, I ended up slewing the scope around all parts of the sky trying to capture data from loads of different targets. So, what I've ended up with is a fair spread of targets, with reasonable data, but none of it outstanding. I need to put that one down to experience! Nevertheless, from the frames that I took, I have managed to put together 4 different images. Each of them have their own faults. Some of them down to there being no guiding, some of them to do with the limitations of my DSLR and some of them to do with relative inexperience of post processing. It's a huge learning curve, but one that I'm beginning to climb. 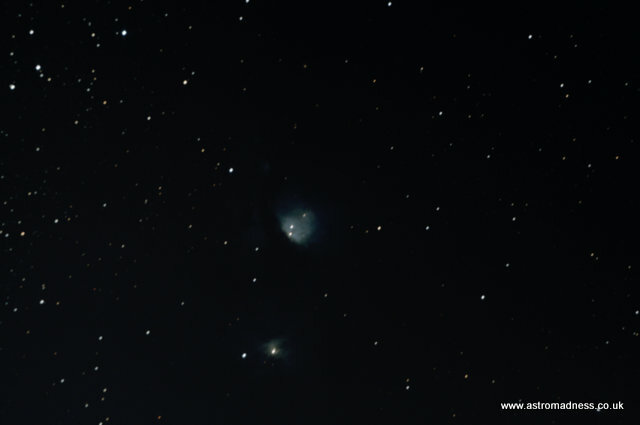 Although I managed to get some limited success with this, M78 proved to be a very tricky target to image. It is a reflection nebula which doesn't seem to be picked up very well by the sensor on my DSLR. However, what it does do is give people a good idea of what many astronomy targets visually look like. Many are nothing more than a grey smudge at the eyepiece. If you were to see a target this bright the eyepiece, it would be considered very bright! The Flame Nebula and the Horsehead Nebula. This is a target that demands plenty of time and effort. You can find them by the left most star of three in Orion's belt. Not to mention the right equipment to photograph it - which I don't yet possess. But it didn't stop me from giving it a go. At the top part of this frame, you will just make out some feint red nebulousness. Then, set in the middle of it, the shape that gives this target its name, a horses head shown in black. In the lower part of the image, we have the Flame Nebula which has shown up much clearer. This image was produced from only 4 frames of data, but with a high ISO setting on the camera. It's come out quite noisy, but with more time and practice, others have produced some stunning examples of astrophotography from this area of sky. 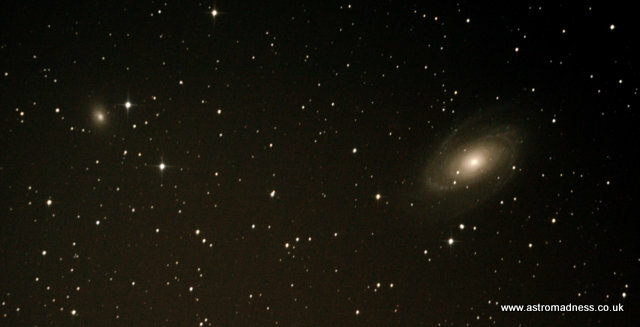 M82 and M81 - The Cigar Galaxy and Bode's Galaxy. Perhaps this is the type of photography that my current set up is suited too. I'm really pleased with this image even though there are signs of significant trailing. On the left, the small smudge is M82. It was in this galaxy that a Super Nova was observed a few years ago, long since dimmed again. Then, on the right we have M81. This a spiral galaxy which I have managed to pick out quite clearly. The 2 prominent spiral arms have come out well but without over exposing the core too much. These an be found near the constellation of Ursa Major, so are visible for a majority of the year. As and when my kit and experience get better, I will come back and photograph them again to see if I can get better results. 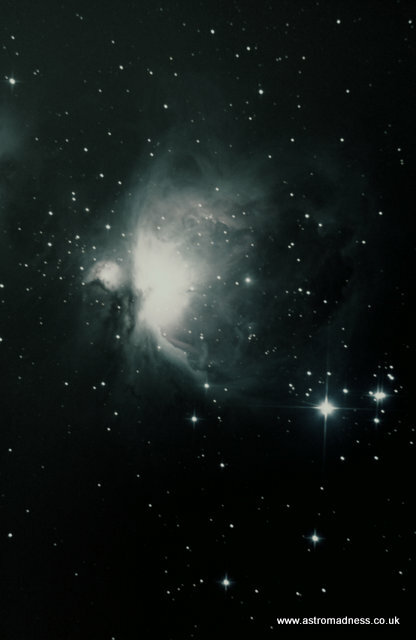 Finally for this collection of images, this one is of the Orion Nebula. In a dark sky environment, you can make this out with the naked eye. There is plenty wrong with this image, but there is plenty that I am also pleased about. 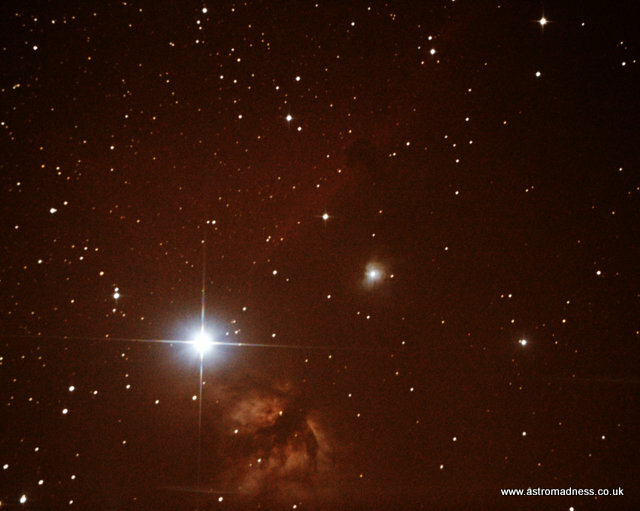 It's the first time I have managed to image the nebula and process is with a little bit of success. The clouds of gas and dust are quite visible, although at the expense of any detail in the brighter core region. Also, I have lost some colour in this attempt at processing, but it will be worth me re-processing this data to see if I can improve it. So that's what I've been up to recently. Practice, practice and practice is what it is going to take!